Get on your bike and pedal for the planet! It’s nearly time for the 2013 Big Green Bike Ride, which is a great way to raise funds for Friends of the Earth. 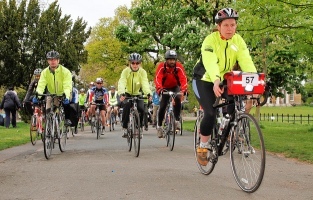 This year’s ride starts on Saturday, 27 April, and the 85 mile route will take you from the hustle and bustle of London, through the country lanes of Surrey and Hampshire, to the New Forest. The next day will be spent exploring the heather-covered heath, farmland, ancient woodland and mudflats of the beautiful corner of the countryside. If you need any training tips, the Olympic Gold Medalist Alex Gold MBE is supporting the event and has written a blog on the Friends of the Earth website which is well worth a read.